There is a long tradition of Art and Music in Robin Hood's Bay, and this continues today. One of the most famous artists associated with Robin Hood's Bay was James Ulric Walmsley (1860-1954), who was a founder member of the Fylingdales Group of Artists. 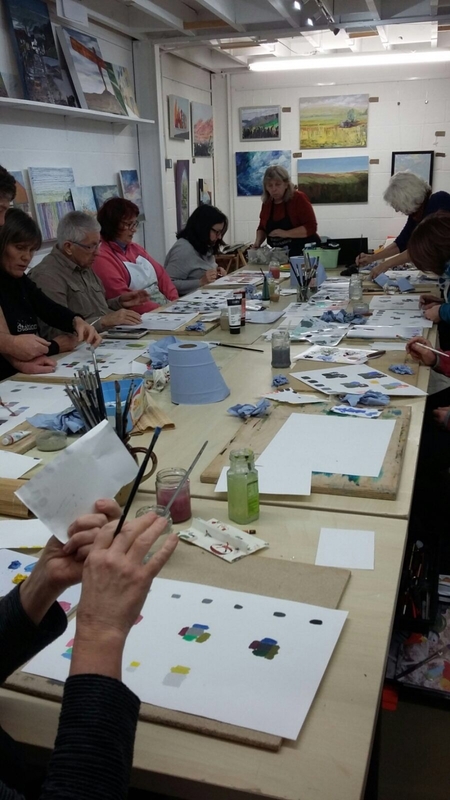 Today there is a thriving Art Group as well as a number of very talented artists living in or associated with the village. Robin Hood's Bay also has a vibrant music scene with live music playing somewhere most nights. The Folk Club meet on Friday evenings in the Dolphin Inn, with regular guest musicians. And in June there is the ever popular Robin Hood's Bay Folk Weekend. Keep an eye on our "What's On" calendar for details of Art and Music events happening around the village. Steve Phillips made his name as a blues guitarist and singer, and as a founder member of The Notting Hillbillies, alongside Mark Knopfler (Dire Straits). Steve Phillips and his band, The Rough Diamonds, have been performing locally for over 20 years. The band is made up of top class musicians and the evening is often host to fantastic guest performers, which has included in the past, Mark Knopfler, Gordon Giltrap and Brendan Croker. Steve Phillips and The Rough Diamonds perform every Tuesday evening from 9pm at The Grosvenor Hotel. Further details and a list of upcoming guest artists can be found at www.facebook.com/stevephillipsmusic.